Life is full of surprises. It starts when you're young: Girls are icky and gross, until the day you realize you'd happily ransom your soul to the devil to get them to pay you some attention. Later, with the acquisition of your driver's license and your first set of wheels you swear you'll never become one of those minivan-owning chumps, and then one day you wake up with three kids, a dog and a need to get them all across town in 15 minutes. And because you're a serious gamer, you blow off the casual genre as something fit for your mom and other people who have no concept of what "real" games are in the first place. And then you catch yourself screaming obscenities at a cartoon dinosaur while multicolored balls fly across your screen as you madly try to arrange them in patterns or blow them up, and your relaxing little time-killer has suddenly got you twitching like a junkie gone cold turkey. Such is my predicament. I take games seriously. I collect them. I read about them, and write about them, on a daily basis. I immerse myself in their uniquely interactive narratives when I can, and in their visceral mindlessness when I can't. But lately, to my growing consternation, I've also found myself playing a lot of games my mom thinks are pretty damn cool. The most recent title to take advantage of my weakened psyche is StoneLoops! of Jurassica, an oddly punctuated release from Polish developers Codeminion. Prior to a couple weeks ago I'd never heard of either the game or the development team, but I've always been a big sucker for lines like, "Hey, c'mere a minute," and thusly introduced to this latest bit of casual diversion I decided to scoop it up and give it a go. My first impressions weren't encouraging. The game has all the elements of a standard PopCap-style release: Lots of flashing lights and sounds, loud explosions, unfathomable bonuses every time you turn around and the inevitable grinning mascot, but it felt more like a checklist of obligatory casual game components than a cohesive whole. And making things worse was the heavy-handed Zuma vibe, the result of the developers obviously taking a little more than just "inspiration" from the casual classic. Or so I thought. "Actually, StoneLoops! is a blend of Luxor and Astropop, but many people ask us this Zuma question. This just shows how big an impact Zuma has made on everybody," explained Konrad Olesiewicz, who founded the Warsaw-based Codeminion with his primary school friend Maciej Biedrzycki in 2000. "We had an opportunity to meet with Jason Kapalka, the designer of Zuma. We actually asked him, "Do you feel offended by StoneLoops?" and he said that absolutely not, as he considers this an original mechanic. We think this cuts all the speculation." Game mechanics in casual games are paramount, since there's really nothing else to fall back on: Great action can save an insipid plot, while mediocre gameplay can be forgiven if its wrapped in a brilliant story. But casual games don't have the safety net provided by that kind of depth. As a result, casual games tend to be more universal in their appeal, cutting across borders, cultures and other demographics more easily than mainstream games, but often also share characteristics that give many of them a feeling of sameness. Most of the major trends in casual games have thus far originated in the U.S., according to Olesiewicz, but he sees things beginning to balance out. "This seems to be changing at the moment as more of the development happens here in Europe and Asia (mostly Russia)," he said. "Additionally, there is very little brand recognition and loyalty when it comes to casual gamers." "Unless you are PopCap, of course," he added. 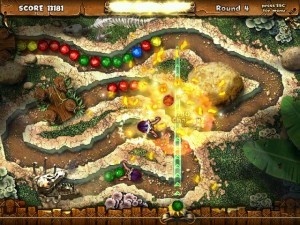 And while the PopCap stylings of StoneLoops! may make it easier to dismiss the game as just another knock-off, as I initially did, the reality is that after three or four levels, the game begins to distinguish itself and your assumptions very quickly go out the window. It barks like a dog, but it bites like an angry cobra.